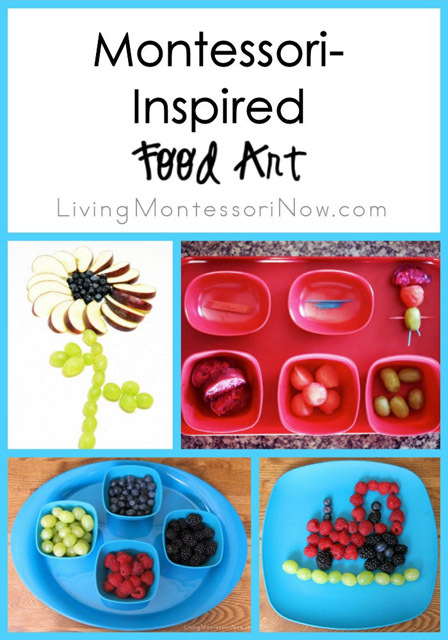 Although this isn’t a traditional Montessori activity, I love the idea of Montessori-inspired food art for fun, creativity, and encouraging healthy eating. 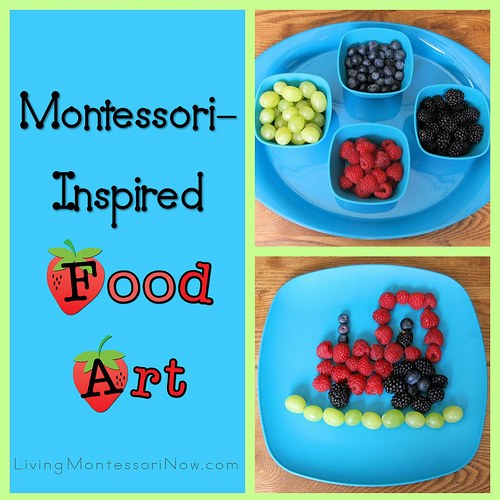 Montessori-inspired food art can be as simple or as complex as you and your child or students wish. It can be used as a creative activity in some form at any age. I’m art challenged, so I asked for help with this project. I simply provided healthy foods – fruits in this case – and asked my daughter and son-in-love to create designs. They’re adults, so their examples aren’t representative of preschoolers’ food art. But the concept is the same. If you like, you can provide examples of food-art designs such as these in cards or photos according to your child’s ability to copy patterns. 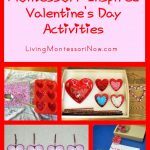 If you’d enjoy the process, you could make food-art design cards similar to the recipe cards in this post: Favorite Recipes for Preschoolers are Often the Easiest. With counting and pattern matching, it could also be a math activity for preschoolers. 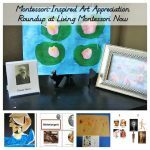 If you’re wondering about having children copy food-art designs, read this post by Carolyn at Inspired Montessori and Arts at Dundee Montessori: Copying Makes Artists? YES! 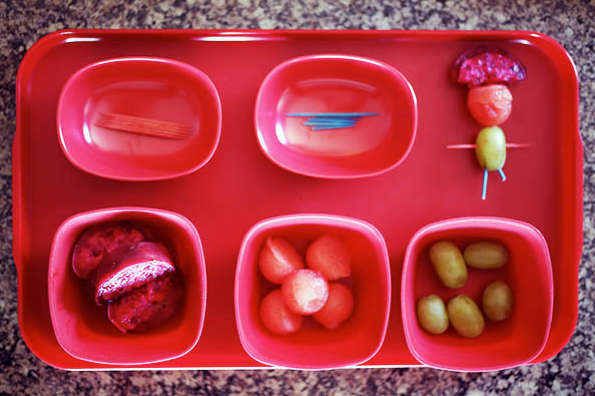 You can vary the foods you provide on a tray for your child’s designs according to your child’s skills in food preparation. 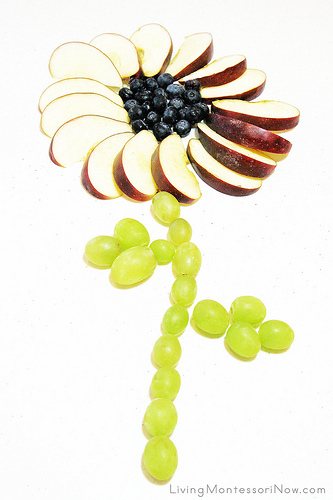 An activity such as the fruit flower would be for a child who could slice fruits unless you slice the fruits yourself. 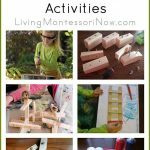 Here are lots of ideas to help your child develop food-preparation skills: Montessori-Inspired Food Preparation for Preschoolers. After your children have created their food-art designs, I recommend leaving the finished creations in their snack area or on a low shelf of your refrigerator for them to eat as snacks. I definitely encourage the use of healthy foods for food art whenever possible. Food art increases interest in the food, and it’s always best when that food is healthy! 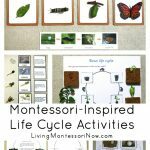 UPDATES: For more healthy-eating inspiration, I have a Montessori-inspired fruit unit and Montessori-inspired vegetable unit. I set up a Montessori-inspired fruit pirate-making tray for a Fruit Pirate Ship (from Fit Body Full Life). What a wonderful excuse for children to play with their food! I cannot wait to see what my oldest son creates. Thank you! What a great idea!My son would be chuffed to see that tractor and would love to try creating it. This is something I haven’t done with my buddies, I have made food art FOR them, but haven’t let them do it. I will have to try this! This is so much fun. I have done food art for my kids before. I always do it for them though. I like the thought of encouraging them to play with their food. I love art activities that use food and keep it edible. I’ve often done a food caterpillar to butterfly activity where you make the caterpillar from grapes (with raisins stuck to toothpicks for the antennae), then make a butterfly using the caterpillar body and triangle toasts with grape jelly. You’ve got the transformation of the caterpillar and the transformation of the grape (raisins and jelly). What a fabulous post as always!! I am going to try this idea with my sensory challenged twin as food is a nightmare experience for me at the moment…perhaps i can turn it into fun!! Love any excuse to play with food! Will have to try this soon! This is awesome. My sons would love that tractor…right before it was gobbled up. I am heading to the farmers’ market, and will pick up the supplies for this! Ahhh… food! It has been a tricky issue in our house; my little one would simply rather not eat! Maybe this would make it a little more enticing. I will have to see! 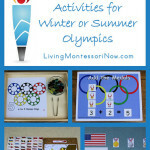 I’d love to have you link up at my Teaching Time for Toddlers post! Oooh this is right up our alley! We LOVE playing with food! Thank you for sharing this wonderful post with the Weekly Kid’s Co-op Deb. 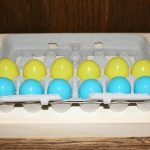 I will feature this post as part of my roundup of this week’s linky party and also pin a picture from your post onto our very popular Weekly Kids’ Co-op Pinterest board :). 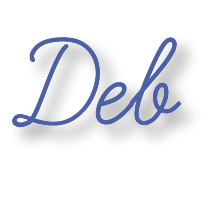 as always fun ideas shared Deb. My girls LOVE to make art with their fruits. I am featuring this on this weekend’s Sunday Showcase as part of my Fun Food features! Thanks so much for sharing with us. Thanks for sharing at the Mumsnet linky.